Floogals: Mission Complete – A wonderful way for younger kids to learn about Planet Earth! You are here: Home / Media Reviews / Floogals: Mission Complete – A wonderful way for younger kids to learn about Planet Earth! 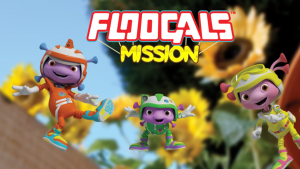 Join the Floogals on a mission of discovery as they explore Earth and the funny hoomans who live there! Each day, Captain Fleeker, First Officer Flo and Junior Boomer encounter something that sparks their curiosity, setting in motion the day s research project and triggering an exciting adventure! First, the Floogals have an adventure in which they must learn the difficult task of assembling the Girl Hooman’s jigsaw puzzle. They learn working in a team wins the day! The projects continue with investigating Boy Hooman’s building of a model rocket, learning how to fly a toy helicopter to rescue Boomer, discovering who stole Dad Hooman’s veggies in the garden and so much more! Adventure is everywhere they go. They’re the Floogals! 3, 2, 1, let s go! KIDS FIRST! Film Critic Dariana A. comments, “Floogals are such a great way to get kids hooked on learning. It has an amazing dynamic and a review of everything they learn at the end, so the kids don’t forget.” Samantha M. adds, “This hilarious animated series had me laughing the entire time. Seeing aliens interact with humans is something I’ve never witnessed before, and the obstacles that the Floogals face are incredibly unique.” See their full reviews below. 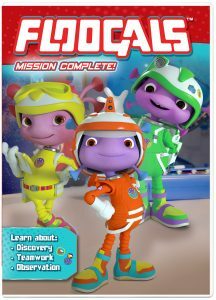 Floogals: Mission Complete is a spectacular DVD. It has great animation, a great way to teach kids about day to day things and the Floogals are such a great way to get kids hooked on learning. It has an amazing dynamic and a review of everything they learn at the end, so the kids don’t forget. It also never has a dull moment, so it will keep kids very interested and wanting to watch more. Floogals is about three little aliens that move into a “hoomans” house. Everyday, they discover something new about Earth and they investigate. While doing that, they teach kids about all those things. There is a wide variety of episodes from teaching kids how mail works, to finding out how seeds grow. This show has such amazing animation. The Floogals are little animated aliens, but they live in a live action world. It’s so cool to see them pick up objects that aren’t animated and they still look like real objects. Another thing I really like is the personalities of all the Floogals. Take Boomer for example. He relates to kids that are shyer and helps them be more out there just like him. I also love the way each episode is formatted. Every episode starts with the Floogals seeing something they don’t understand. Then, they find funny uses for it and, in the end when they find out what it is, they go over everything they learned. It’s a great tool to help kids remember what they learn. One of my favorite episodes is “Project Mail.” I really like it because, as a kid, I never would have known how mail worked and this would have been really cool for me to watch at a younger age. If I could change one thing about the Floogals, it would be how long Boomer’s name is. On the show they call him Junior-Floogal-Boomer. I think it would be better as just Boomer. The message of this show is that you should go out and learn something new every day. I give this DVD 4 out of 5 stars for its great animation, awesome plots and incredible characters. I recommend this DVD for ages 3 to 6. This DVD will be released on September 12, 2017 so be sure to check it out. This hilarious animated series had me laughing the entire time. Seeing aliens interact with humans is something I’ve never witnessed before, and the obstacles that the Floogals face are incredibly unique. As soon as I began watching the series, the Floogals have to face a giant cat, which did not fail to make me laugh. With many twists and turns, you will never get bored. Rasmus Hardiker, who plays Captain Fleeker, is the lead Floogal. Fleeker always manages to come up with solutions to problems that the Floogals face. For example, when the Floogals ruin a jigsaw puzzle that a little girl built, they have to find a way to rebuild it before she comes back. Hardiker’s voice is very deep, but it’s also very optimistic, which makes his character very relatable. Hugo Harold- Harrison, who plays Boomer, is the funniest character I’ve ever seen. Boomer doesn’t think before he acts, which lands him in difficult situations. Boomer is in charge of watching the cat while the other Floogals rebuild the jigsaw puzzle. Harrison’s voice is filled with fear, which makes it hilarious. The animation in this show is very realistic. The house that the Floogals live in looks just like mine! Their uniforms are the coolest uniforms I’ve ever seen. I wish I could be a Floogal! My favorite part about this series is its theme song. It is incredibly catchy, so prepare to have it get stuck in your head. I love the ending of each episode, because Fleeker, Flo and Boomer each provide their personal perspective about their daily adventures. It’s great to hear their differing opinions, which makes their friendship work. Fleeker, Flo and Boomer are undoubtedly best friends, and you’ll wish that you could join them on their adventures. The message of this series is to explore everything that life has to offer and to keep an open mind. The Floogals are nothing like humans, but they learn to love what humans can do. I give this DVD 5 out of 5 stars and recommend it to kids ages 4 to 8. With non-stop adventures and many jokes, there is something for everyone to enjoy. This DVD is available on September 12, 2017 so, be sure to look for it. I can’t wait to watch the second series.